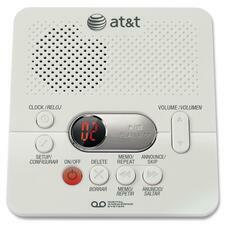 Digital answering system features adjunct 40 minutes digital record time, English and Spanish voice prompts. single digit message and counter time/day stamp message guard. Memory requires no batteries. System also offers remote access, toll saver call screening intercept and CID number announce. Digital answering system records outgoing announcements and incoming messages on a microchip with up to 60-minute record time. Other advantages include Message Guard memory for power failure, tapeless operation, time/day stamp, reliable performance, instant access to messages and call screening/intercept. Selectively save and delete messages. 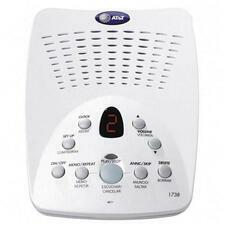 Listen and change outgoing announcement remotely with touch-tone phone. Digital answering system announces time and day of each message before playback. Other features include remote access with toll saver, variable message playback speed, message time/day stamp, auto reset answering system clock and English/Spanish voice prompts.